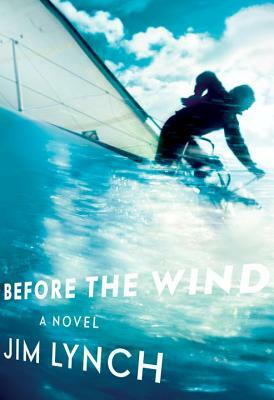 Before the Wind, by Puget Sound author Jim Lynch is just the book for sailing fans. Among Lynch's earlier works are: The Highest Tide, about a young boy & a giant squid, and Border Songs which is a tender novel about a border guard at a US & Canada crossing. Before the Wind is about an obsessive sailing family of three generations. There are a lot of technical sailing terms and descriptions at the start of the book to help inform the reader about sailing. The three children in the family grow up and scatter to various parts of the world for different reasons, but they reunite to sail together in a huge race called Swiftsure. Readers might be reminded of the old book A River Runs through it. This family if also led by an overachiever who instead of fishing, thinks that sailing is the only life style. This is a dramatic and exciting book." Following The Highest Tide, Border Songs, and Truth Like the Sun, Jim Lynch now gives us a grand and idiosyncratic family saga that will stand alongside Ken Kesey’s Sometimes a Great Notion. Joshua Johannssen has spent all of his life surrounded by sailboats. His grandfather designed them, his father built and raced them, his Einstein-obsessed mother knows why and how they work (or not). For Josh and his two siblings, their backyard was the Puget Sound and sailing their DNA. But both his sister and brother fled many years ago: Ruby to Africa and elsewhere to do good works on land, and Bernard to god-knows-where at sea, a fugitive and pirate. Suddenly thirty-one, Josh—who repairs boats of all kinds in a Steinbeckian marina south of Seattle—is pained and confused by whatever the hell went wrong with his volatile family. His parents are barely speaking, his mystified grandfather is drinking harder, and he himself—despite an endless and comic flurry of online dates—hasn’t even come close to finding a girlfriend. But when the Johannssens unexpectedly reunite for the most important race in these waters—all of them together on a classic vessel they made decades ago—they will be carried to destinies both individual and collective, and to a heart-shattering revelation. Past and present merge seamlessly and collide surprisingly as Jim Lynch reveals a family unlike any other, with the grace and humor and magic of a master storyteller. JIM LYNCH lives with his wife in Olympia, Washington. His novels The Highest Tide, Border Songs, and Truth Like the Sun have been adapted for the stage in Seattle. His prizes include the Indies Choice Honor Book Award, the Washington State Book Award for Fiction, and the Pacific Northwest Booksellers Award.